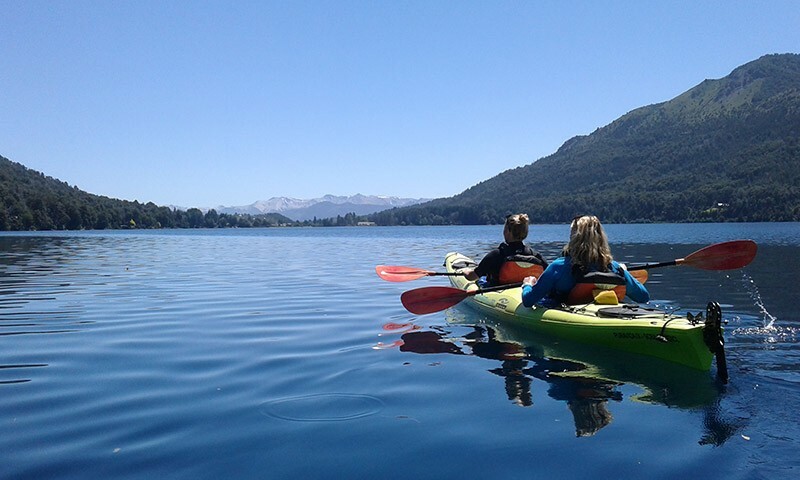 Patagonia is a privileged place to practice kayak in calm waters. Gutiérrez Lake is surrounded by native forest with huge coihues spreading their arms in the waters, waterfalls that flow into the lake, sunken trees under crystal clear waters and fuchsias or other wild flowers growing along the shore. Paddling in the lake is magical. The views are incredible; Peace penetrates the soul. True specialists in kayaking in the National Park will ensure professionalism, great knowledge of the area and first class international equipment. After an instructive talk about the equipment and kayak management, the guide will lead the passengers in a safe and pleasant way. We will start with a guided crossing in kayak crossing the bay of the lake. This is one of the few places on Earth where the waters are so clean and pure that they can be drunk directly from the stream or waterfall without danger! After touring the bay along its shore we will take a break and delight ourselves with a rich box lunch prepared at Estancia where the meals are balanced, delicious and healthy, based on homemade products. At the end of the lunch we will prepare to continue exploring the wonderful crystalline waters and virgin coasts of Gutiérrez, and we will return paddling to Estancia. After having lived a day of intense contact with nature and high fun, we will move back to the city. Bilingual kayak guide / s.